On 27 May 1781 SUSAN LIVINGSTON wrote from Elizabeth Town, New Jersey, to her sister Sarah Jay who was in Madrid where her husband John had been sent on a diplomatic mission. At that time Sarah was the only wife of an American diplomat who went abroad with him. The Jays left their young son Peter Augustus with the Livingston family; it was Susan who assumed the major responsibility for his care and education. In her letter Susan remarks on the difficulty of keeping in touch by mail. Writers and recipients usually began their letters by noting the dates of letters they had received. Letters destined for Europe were often carried by friends who were going abroad. Duplicates were frequently sent by different means in the hope that at least one letter would get through. They were often entrusted to the captains of ships bound for cities in Europe where they would be forwarded to their destinations. Letters had first to reach the port of departure; remember that the voyage across the Atlantic took at least six weeks, more in bad weather, and there was always the danger of the vessel being captured by the enemy or by privateers, as Susan describes. It has given me real concern to find that of all my letters to my Dear Sister one only has reached her. I cherished a hope that some written last Summer would undoubtedly have gone safe. . . . It is impossible to recollect the number I have written, nor can I account for the miscarriage of all of them, without suspecting that some have never reached Phila and others never left it; the carelessness of People with respect to these letters is really unpardonable, many have been lost betwixt Kitty and me since her residence in Philadelphia by Gentlemen that one would have imagined would have made a point of honor out of their safety. I penned a number of sheets last July at Baske [Basking Ridge just west of Elizabethtown], part of which contained a particular detail of British maneuvres in this State the preceding month. . . . While the enemy lay at the Point . . . we all made good our retreat, except Mama and Mrs. Linn [Susan’s sister Mary who was married to James Linn]. During the 3 weeks they were at the Point, our House was between two Fires. . . . Mama had a forced march 5 miles across the Country. She was so terrified that she was sure she could not survive. . . . Your little Heroe was here when they first pushed into the Country, and was much amused with the sight of such an Army. He shook hands with a British Gentleman who bid him not be afraid, and said he supposed the Child had been taught to think they would tear him to pieces. . . .
You must do me the justice dear Sister to believe that I have wrote very frequently to you since the last mentioned Letter. In the Fall I gave you an account of Arnold’s Perfidy, and several other interesting matters in Letters that went with Colonel Palfrey who sailed from Phila with some other Gentlemen in a new Merchantman, the best that has been built since the War; Mr. [Robert] Morris was principal owner. There’s great reason to think the Ship is lost, as she has never been heard of since; one that sailed in company with her was captured and carried to England. It is said that General Arnold was to be recompensed for his treachery by the value of the Stores at West Point which amounted to ƒ30,000. He has carried on the War with great acrimony to the Southward. Does Spain furnish any examples of such finished Villains? I wrote you the 10th of this month . . . I write now in great haste, otherwise I shall lose the opportunity of sending this to Phila. Harry [Henry Livingston, Jr.] recommends it to us to send our Letters from Newberry Port as the safest Channel of conveyance, but the risk they run of being lost, in such a long Journey is almost equal to the dangers of the voyage. . . . The three unarmed Vessels Harry wrote by from LOrient are all safe in Port; he reasoned prudently when he declined sending any thing in those Ships, and prefered the Luzerne, but our wisest measures are often baffled by events; the Luzerne was captured 9 Days after she left France. I can only say we are truly unlucky. Mr Morris is a great loser by the Capture, her Cargo was very valuable. . . . Adieu my dear Sister. God bless you, and all that are dear to you. Source: John Jay: The Making of a Revolutionary, 1780-1784, edited by Richard. B Morris (New York: Harper & Row, 1975), 185-187. I thought I would continue in a lighter vein with some insights into the lives of George and Martha Washington. William Maclay represented Pennsylvania in the United States Senate from 1789 to 1791. The diary he kept during that time is one of the few records of what went on in that body—sessions would not become public until 1795. He was a staunch critic of the Federalist party as is clear from his journal entries. He also commented on his other activities, reporting that on June 11, 1789 he had dinner with Robert Morris and his family—Morris was the other senator from Pennsylvania. He recounted an amusing anecdote related by MARY WHITE MORRIS about an experience she had while dining with the Washingtons. Maclay’s Journal can be found HERE, pages 73-74. 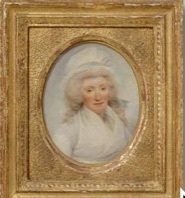 The portrait of Mary White Morris was painted by John Trumbull in 1790 and is at the Philadelphia Museum of Art. It is not fair to MARY WHITE MORRIS, or you the reader, to abandon her without giving some information about subsequent events in her life. The Morrises were among the first families of Philadelphia after the Revolution, entertaining the nation’s leaders as well as distinguished visitors and diplomats from abroad. During the constitutional convention held there in 1787, George Washington stayed at the Morris House— Robert Morris made the motion for Washington to preside over the convention. After the Constitution was ratified, Morris was chosen by the Pennsylvania legislature to be one of its two senators in the new government. Martha Washington did not attend her husband’s inauguration as president in April 1789 in New York City but subsequently made her way north, honored and feted along the way. 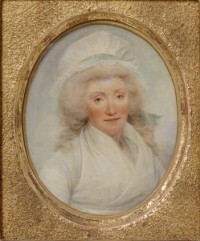 She stayed for several days with Mary Morris in Philadelphia, who then accompanied her to New York where Mary was present at the first levée held by Mrs. Washington in May. Robert Morris declined the position of Secretary of the Treasury which President Washington had offered him, preferring to tend to his personal business. When the capital of the United States was moved to Philadelphia in 1790, Morris gave up his house to the President and moved to an adjacent dwelling. The hot air balloon described in an earlier post was launched from his back garden in 1793. At the end of his second term in 1797, Washington gave a farewell dinner at which he presented Mrs. Morris with a portrait miniature of himself. During this period Robert Morris’ financial troubles multiplied as a result of excessive spending and bad investments. He rashly speculated in western lands in several states and overextended himself right before the Panic of 1796-97. His creditors caught up with him and in 1798 he was sent to debtor’s prison in Philadelphia where he remained for more than three years. Mary, the loyal wife, visited her husband daily and often took dinner with him. Morris was released from prison in 1801 with the passage of a new bankruptcy law. Gouverneur Morris (no relation), perhaps the closest of their family friends, arranged for Mary to have an annuity of $1500 a year that allowed the pair to live in modest circumstances until Morris’ death in 1806. The portrait of Mary White Morris was painted by John Trumbull in 1790 and hangs in the Philadelphia Museum of Art. A summary of the life of Mary White Morris is included in an ADDRESS delivered in 1877, which includes the obituary. The last post referred to the friendship between MARY WHITE MORRIS and the sisters Kitty Livingston and SARAH LIVINGSTON JAY. Sarah was one of the few wives who accompanied their husbands on diplomatic missions abroad. She was brave enough to undertake what was very much a dangerous crossing of the Atlantic and emotionally strong enough to leave their young son in the charge of her parents in New Jersey. She missed her friends in America and tried to stay in touch by mail which was unreliable at best. Following is one of a series of letters she wrote to Mary Morris, this one from Madrid where John had been sent to try to secure loans from the Spanish.
. . . As Mr. Jay & myself are interested in Mr. Morris’ and your happiness, we were very anxious last fall about both your healths, for we had heard (from France) that they were impaired, & a letter from Kitty some time after was doubly welcome by giving us the pleasing information of the recovery of persons we so much esteem’d, and likewise the re establishment of mama’s & her own health. How amply, my dear madam! does your affection compensate Kitty for the absence of her sister—but where can I hope to find such friends as I parted from in quitting America—not I am sure in the acquaintances of a few months or in the formal birthday visitors—preserve therefore I charge you the regard you honor me with, that in your company when I return, I may forget how long we have been seperated. I dare say you were pleased with the marriage of Mr. [William] Bingham & Miss [Ann] Willing, as it promises happiness to the parties interested: shall I request you to present to them our congratulations? Tell Miss Hetty [the oldest Morris daughter, aged seven] if you please that if she thinks she can smile upon a Don, I’ll use my influence to engage a few to accompany us, for we hope to return before she seriously thinks of paying her devoirs to Hymen. Kitty’s accounts of Maria [a Morris daughter aged two] increase my inclination to see her; and I am quite happy that your little sons are likely to answer the expectations form’d of them. . . .
You & Mr. Morris will do us justice in believing that you have not more sincere friends in the numerous circle of those who love & esteem you, than in Mr. Jay and your humble servt. I have often smil’d at the apologies made for Incorrect letters, but none ever requir’d them more than this. The expression “paying her devoirs to Hymen” refers to courtship and marriage. I would think Hetty was a bit young to be thinking such thoughts—but maybe not. Ann Willing was a Philadelphia socialite regarded as one of the most beautiful women in America. She married the wealthy William Bingham referred to in this post. The letter is in the Robert Morris Collection, Henry E. Huntington Library. 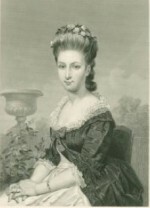 The print of Sarah Livingston Jay is from the Print Collection Portrait File of the New York Public Library. Among the circle of friends of MARY WHITE MORRIS were the daughters of William Livingston and Susannah French, particularly Catharine called “Kitty” and Sarah who had married John Jay. The Jays had sailed for Europe in 1779 when John had been appointed minister plenipotentiary to Spain. The vessel they set out in was dangerously disabled by a storm and had to put in at Martinique (referred to as Martinico). Securing passage on another ship John and Sarah arrived at Cadiz and proceeded to Madrid. Kitty Livingston had enjoyed an extended visit with Mary and Robert Morris during the summer of 1780. From August to October she had returned to the family home, Liberty Hall, in Elizabethtown, New Jersey, to tend to her mother who was ill. She subsequently fell ill herself. Mary wrote to her from Philadelphia. Be assured my dear Kitty, that tho, this is the first moment I have found leisure to write to you, You have been the constant Companion of my thoughts, this is the only Resource Left For the loss of your Sosiety, which I do assure you, can not be made up to me here, Our little boys Arrived a day or two after You left us, as Shabby as lolls, but a welcome, as the fondest of Parents, cou’d make them – last Evening they and Miss Hetty (the Morris daughter Hester known as Hetty) Gave a Ball, to the Masters, & Misses of their Acquaintance, Bob (Robert Morris Jr,) Opend it, in a minuet with much Applause, which gave Me Sensations, Similar and Equally flattering to any I ever felt, when giveen [sic] to myself, on such occations, This is encouragement For you to Marry as you see we have the advantage of loveing over again – [M]y party on the occation [included] . . . the Minister, Monr. Marbois, Mr. Bingham. A Propo you have I suppose received the letters sent you by this young Gentleman, from Mrs. Jay, which was Wrote at Martinico I sincerely wish, he had Arrived a Few days sooner, that you might have partaked, if you will allow me the expression, of my pleasure, in hearing from him talk of Mrs. Jay, who he says, is the lovelyest women [sic] he ever Saw, and that if She had been the Queen of France, could not Have met with more attention, than were paid Her in that Land. I do most heartily Congratulate you, & yours, my Dear Kitty, on the wish’d for Intelligence, of your dear Freinds [the Jays] being Arrived safe at their Destined Port. [T]he emotions I felt after hearing they were safe, was to fly to you with the News, but upon Enquireing, found it came here from headquarters, of course you had it before us. . . .
Robert Morris adds in a postscript to “my worthy & amiable Friend” that “Molly” (Mary Morris) wrote the letter despite a bad headache. François Barbé-Marbois was the French chargé d’affaires. William Bingham arrived in Philadelphia in late April or early May carrying letters from Sarah Jay written in Martinique. The word “lolls” in the letter means an idle person; a spoiled child. Massachusetts Historical Society, Matthew Ridley Papers II (1754-1782), Box 1 of 5; Ms. N-797. transcribed by Louise North.